Creating a safe, nurturing environment that promotes teamwork, networking, and a will to succeed. Our goal is to build relationships through comradery and healthy competition. Safety First! is the latest of a number of safety initiatives that Cheerleading’s governing bodies have implemented in past years. The results show, among other things, that cheer’s total catastrophic injuries were cut in half from 2005 to 2006*, and that cheerleading’s injuries per 100,000 participants is only 2.0, significantly less than the figures for popular women’s sports such as gymnastics. 1. Proper Conditioning: Physically prepare and maintain your body’s strength, flexibility, and stamina for stunting and tumbling. Strengthen your core muscles (abdominal and lower back muscles) along with the upper and lower body and include aerobic (running, jogging, cycling, swimming) and anaerobic (wind sprints, circuit training) activities. 2. Exercise Reminders: Warm up, stretch and cool down for every practice or competition and be sure to rest. 3. Proper Equipment: Practice on mats or padded flooring until your routines are perfected. Make sure the mats are adequately sized and sufficient for the activities you’re performing. 4. Spotting: Have trained spotters present and engaged at all times. 5. Knowledgeable Coaches: Make sure your coaches are certified in safety, first aid, CPR and AED use. 6. No Horseplay: Focus at all times during stunting and tumbling activities. 7. Communication: Request that your coaches review safety precautions, rules and regulations with the squad on a regular basis, and that they establish and implement an emergency action plan. 8. Read Safety Guidelines: Ask your coaches to be familiar with the latest AACCA safety guidelines; the safety advice in the National Federation of State High School Associations’ “Spirit Rules Book”; and the rules and regulations pertaining to your particular school. 9. Know Your Limits: Be aware of your ability level and do not attempt advanced level gymnastic or stunting skills before mastering less advanced skills. Always have a supervisor present. 10. Treatment of Injuries: Promptly attend to any injuries you sustain. Your school or organization’s athletic trainer can assist in the proper treatment and prevention of such injuries. He or she can also offer an injury prevention education seminar and assist in creating the conditioning routine. 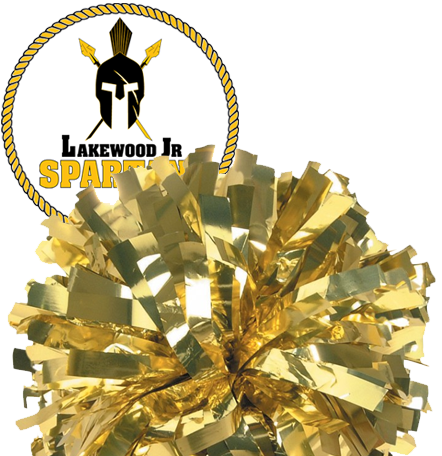 Welcome to the Lakewood Jr. Spartans. Please use the form below to contact us with any questions in reference to our programs. We will contact you as soon as possible.